I couldn’t wait to share this recipe with y’all!! 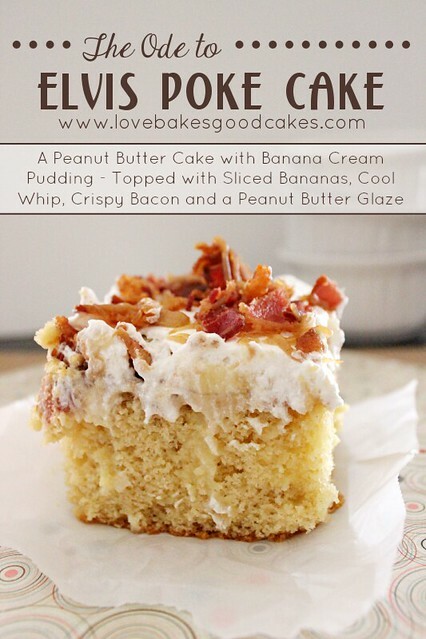 I have had the idea to create an Elvis Banana Split using Homemade Peanut Butter Ice Cream for quite awhile now! 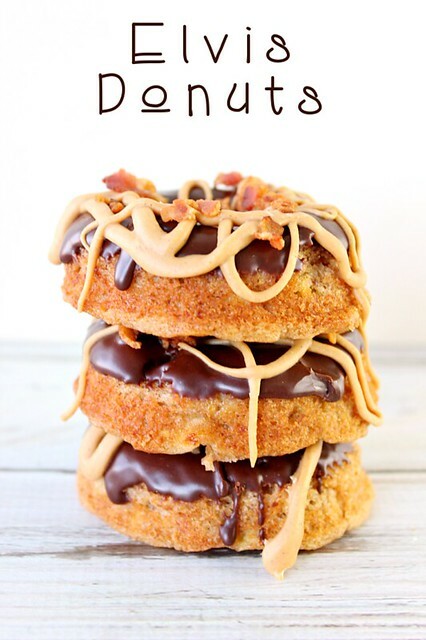 Knowing that I would be taking part of #baconmonth, I wanted to wait until now to share it with y’all …. sorry, I’ve been holding out on you!! We’re still friends, right?! 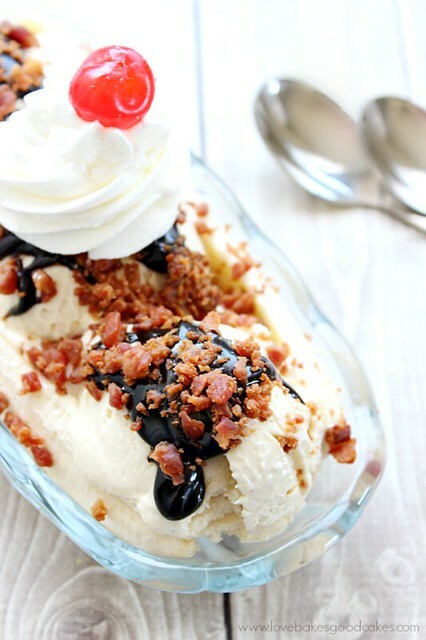 Although I personally believe banana splits are made to be shared, you might be tempted not to share ……. and that’s ok! 🙂 No judgement here! Be forewarned this is not diet food … I wish it was – but it’s not! 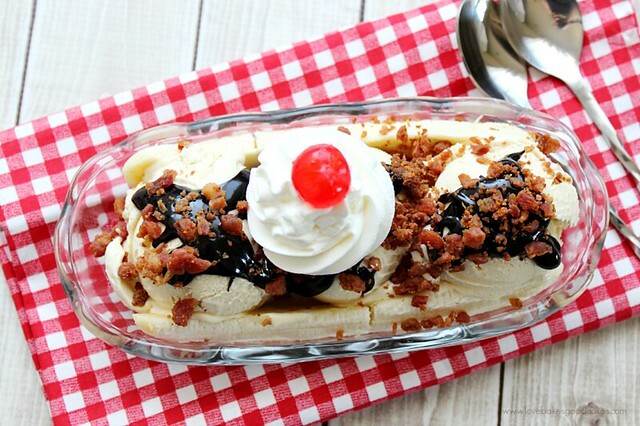 However, if you’re looking for a crazy delicious treat – and a fun new twist on the banana split – definitely give this Elvis Banana Split with Homemade Peanut Butter Ice Cream a go …. you’ll be glad you did! In a medium saucepan, combine the heavy cream, milk and sugar. Bring the mixture to a simmer over low heat. Cook and stir until the sugar is dissolved. Beat the egg yolks in a medium bowl. Slowly add one cup of the hot cream mixture to the yolks to slowly bring it up to temperature. Pour the yolk mixture into the cream mixture and continue to cook and stir until the mixture just coats the back of a spoon – about 5 to 10 minutes. Remove from the heat and stir in peanut butter and salt. Allow to cool for about 15 minutes before transferring to an airtight container. Let the mixture mature in the refrigerator 8 hours or overnight. Freeze the peanut butter mixture according to your ice cream maker’s instructions. Transfer the ice cream to an airtight container and freeze at least one hour before serving. Split the banana in half lengthwise. Place on each side of a banana split boat. Place 3 scoops of peanut butter ice cream in the dish, between the banana slices. Drizzle hot fudge sauce over the ice cream. Sprinkle with crumbled bacon. Garnish with sweetened whipped cream and a cherry. Serve immediately! 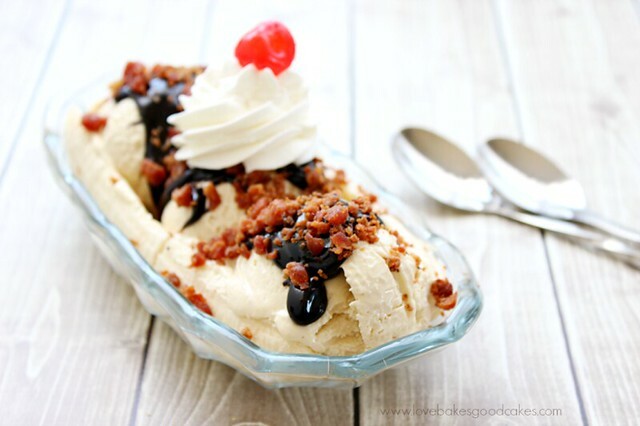 Mmmm….bacon on ice cream? I'll take it! Girl…..you have OUTDONE yourself!! This looks absolutely amazing! And with homemade peanut butter ice cream, too? Seriously can not wait to try it!!! 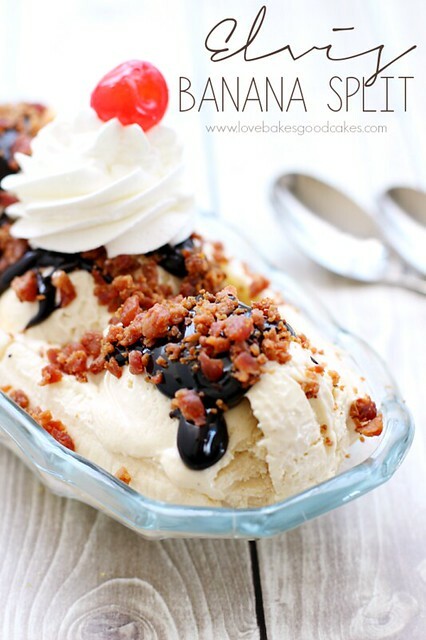 My husband and I just have to have our Banana Split every once in a while, this looks so good! Thanks so much for sharing with Full Plate Thursday and have a great weekend! I gained 50 lbs looking at this 🙂 Thanks for posting at #TheWeekendSocial! Fun banana split, Jamie! I'm still drooling over PB ice cream.